As Cyclone Marcia gets downgraded to a Tropical Low weather system, my soil and crops have had a good soaking: 236mm in the past 48 hours. No crop losses so far – 106 different edibles available. Lucky conditions for my ‘Red Aztec’ corn and Jerusalem artichoke ‘Dwarf Sunray’, they’re just days from harvest. During cyclone season it’s wise to remove objects that can become missiles from the garden. Garden furniture is securely stowed. I removed dead fronds from palms and Pandanus tectorius a fortnight ago. I’ve pruned branches from my neighbour’s tangled trees so none can hit the phone line and trimmed banana leaves so they can’t hit guttering. I keep my flowering gum tree, out in the nature strip, pruned well below the powerlines in the street. When the cyclone watch was issued, I edged the sweetpotato in the nature strip to make sure no growth impeded the flow of storm water along the gutter. First flush devices and rain heads are washed clean, ready for action. I removed leaves from the stormwater infiltration well in the front garden. If it’s emergency overflow is needed, I don’t want that blocked by foliage. 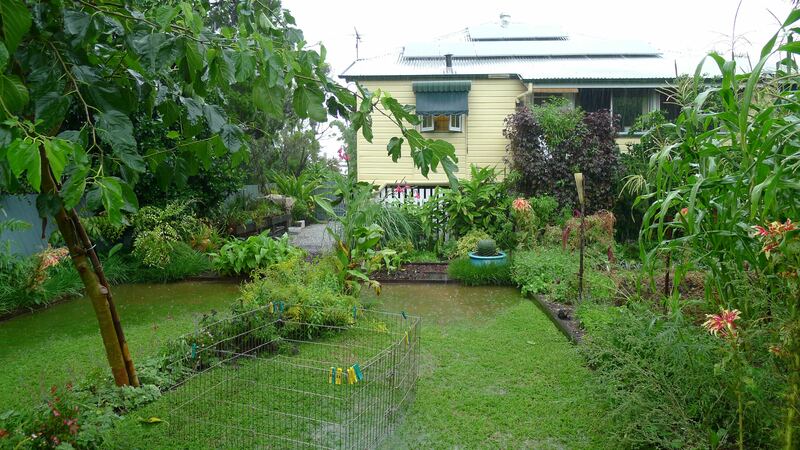 When ex-Cyclone Oswald scoured the coast in January 2013, it ripped out my lawn specimen fig tree, so I replaced that shallow-rooted, softwooded tree with a hard wooded mulberry. Oswald’s buffeting salt-laden winds rattled the house and killed the foliage of Eucalyptus trees (E. tereticornis especially) up to 1.5km inland. Salt spray ruined the foliage of certain plants in my garden, Amorphophallus spp. being particularly affected, and I was removed seagrass, blown from Moreton Bay, from my gutters. At the time, my mature ‘Parramatta Sweets’ mandarin was fruiting, and winds twisted the main stem and split it. The crop was lost and the tree hasn’t flowered since. Since my pawpaws are big and copping well, I picked a dozen of their easily damaged, semi-ripe fruit. Don’t want to lose the lot. Remembering this, I decided to move all my delicate nursery stock underneath the house (and bagged horse manure), standing them out on gravel above the level that floodwater has been known to rise. My stock of Elephant’s Foot Yam (Amorphophallus paeoniifolius) are especially tender and vulnerable to salt damage. Expecting a thorough soaking, I sowed a strip of soil with corn to grow a new block of fodder to feed the guinea pigs. I also cut and edged the lawn, just in case the soil became too muddy to walk or work on. During the rains, the rainwater tank and the stormwater infiltration well overflowed. There was some ponding on the lawn (which is designed to retain, not shed water), but this drained once the rain stopped. Water in the lawn and infiltration well were clear and sediment free. So far, all garden systems are functioning. Much of my garden acts as a living larder: there’s food in the ground (sweetpotato, cocoyam), food on the trees (pawpaw, palm seed, fruit), roots, shoots and leaves. But I also keep the recommended supply of dried and tinned food – sufficient for my household to feed itself without electricity for three days. Panic buying rarely affects dried food: peas, beans, chickpeas, etc, which can be soaked and boiled – if you have a gas cooker or barbecue. I’ve got about ten kilos of bunya nuts from Ormiston – a windfall crop – so I’m experimenting with recipes. Roasted bunya nuts with kaffir lime and lemon dipping mayonnaise is great and I’m loving roast Bunya nut with endive salad and horseradish cream and lime dressing. Yum! Despite the challenging weather there’s always something that relishes warm, wet weather. My endive is all self-sown and my cassava, pineapples, bananas and spices are doing splendidly well. its also very wet here at murgon.have had much needed rain to fill old and new tanks. love your garden.cheers jennifer little. So satisfying to have a full tank! Could I buy an elephant for yam for Townsville please? They are exclusively available to visitors at my annual Open Day, Mother’s Day weekend.